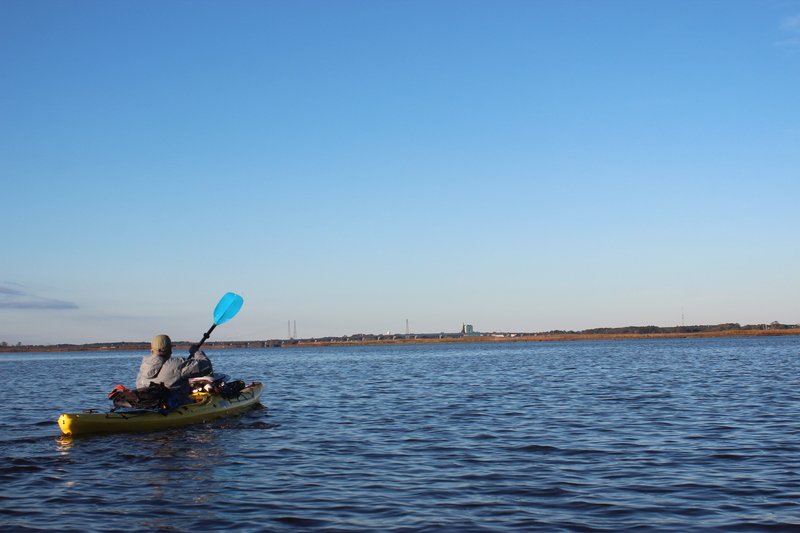 A paddle down the Nanticoke river. 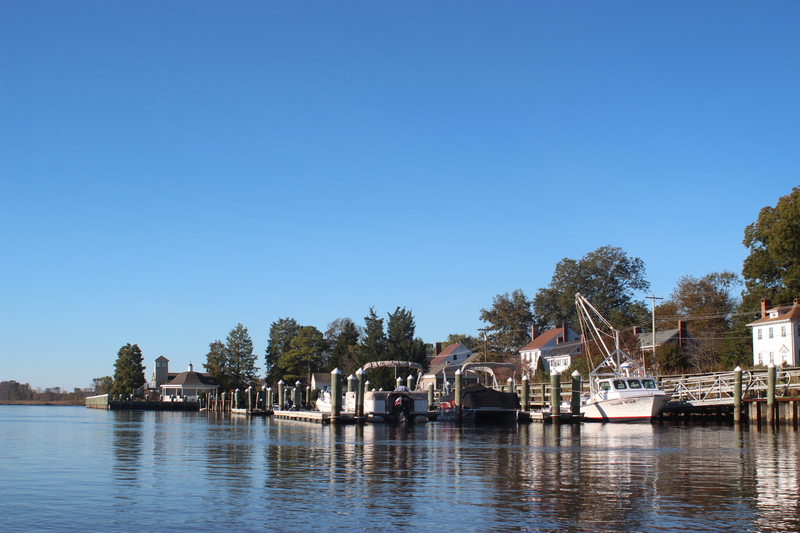 A @ 64 mile river that runs from mid-Delaware through Maryland and into the Chesapeake bay – I knew little about it. The only thing historical that I knew (and not for sure) is that Captain John Smith had made his way up it in the 1600’s while exploring the ‘nook’s and crannies’ of the Chesapeake bay. Now I wasn’t much in school, but history could hold my interest longer than anything else. Life at 60 (mph) now has me spending about four months a year in the area and the Nanticoke has been a tempting target for a paddle. In liking distance paddling and having this river close left the possibility of a short shuttle – with an easy pick up only an hour or so away. 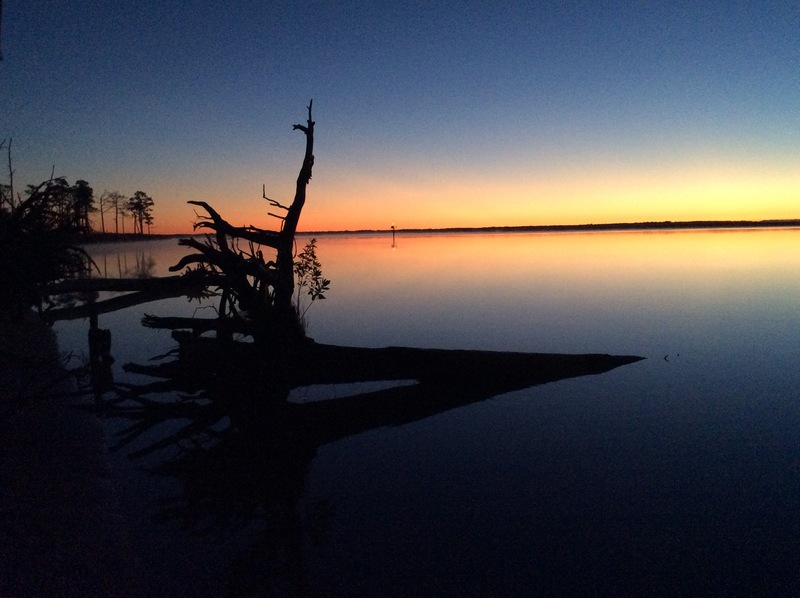 The peninsula of Delaware/Md and the eastern shore of Va is not a large expanse – end to end is a casual ride on the backroads. Gordy (a brother-in-laws brother) nearby and always always willing to get out and sleep under the stars, was eager for a paddle too. 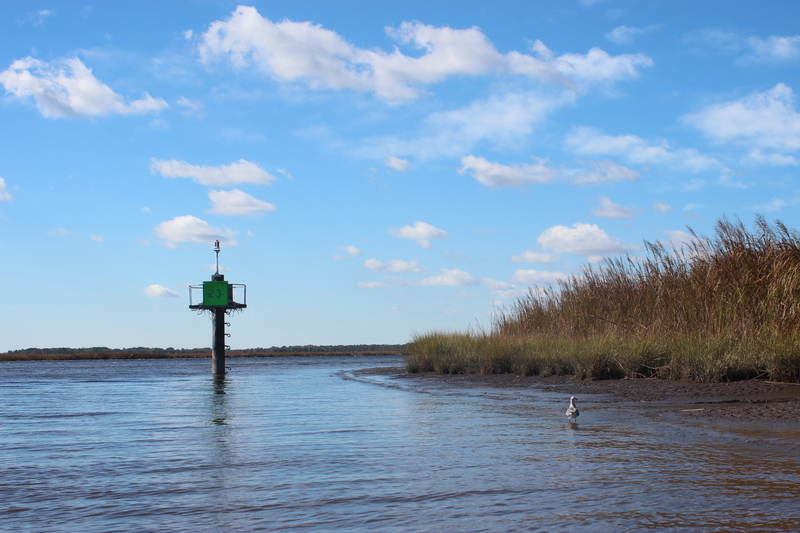 We launched from the Seaford city boat ramp on a Thursday and figured for three or four nights on the river. The trip wasn’t about speed; it had been a long summer without any overnight paddles – I really just wanted to get out of the house and break the cycle of things, so maybe this was more a paddle about escape…..
We launched at low tide. If a person could choose their date of paddle and have it coincide with the tide – paddling ‘out’ to the bay would be best with a launch at high-tide – you could ride it outward. Fot this trip each morning for us was low tide – at 8 am……its just water under you. Minimum goals were; reaching Nanticoke, Md on the Chesapeake bay with a secondary goal as Deal Island and a greater goal of reaching Christfield, Va. Meeting the later two goals would require several miles of open bay to complete; anyway this was our mindset at launch. In the beginning several creeks combine at Middleford to form the Nanticoke. 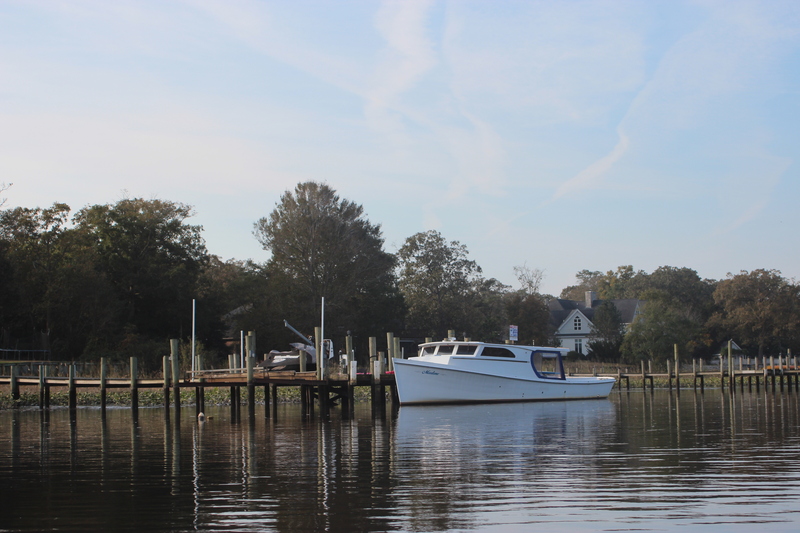 It becomes a navigable river while progressing through the downtown area of Seaford. 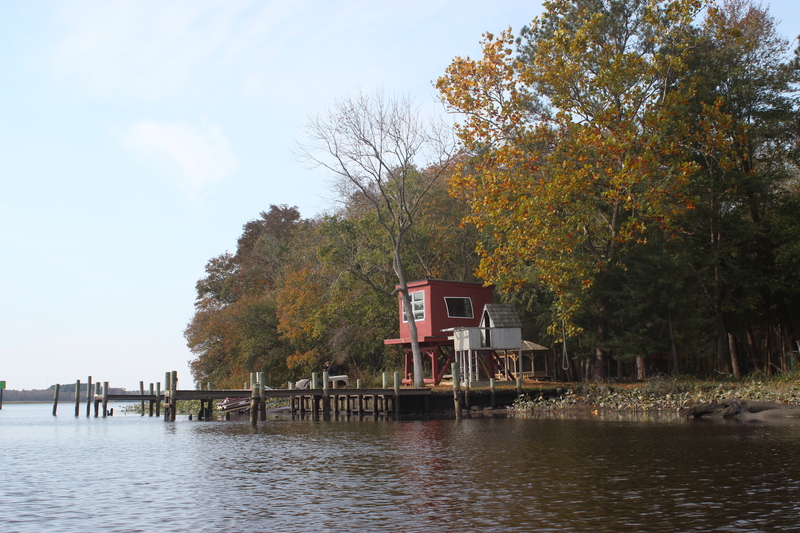 With access to the Chesapeake, the Nanticoke’s waters are tidal and its shores hold a palpable feel of ‘coastal’ flavor. 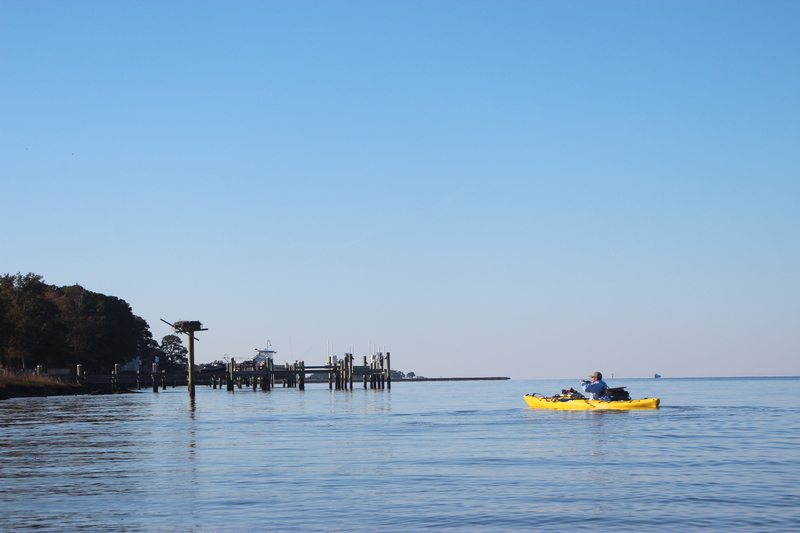 The view from a kayak is from ‘see-level’…..
We noticed the numbered channel markers, Seaford stood in the 68 region; not sure if they stood for the actual mileage because with the calm waters of the morning it sure seemed like they passed quickly. It felt good to be back on the water. The water was flat and I forgot about my arms; that happens when the natural setting of a place takes over your thoughts. Its through these two portholes that I am allowed to observe life along another of earth’s wonderful tear-ducts. 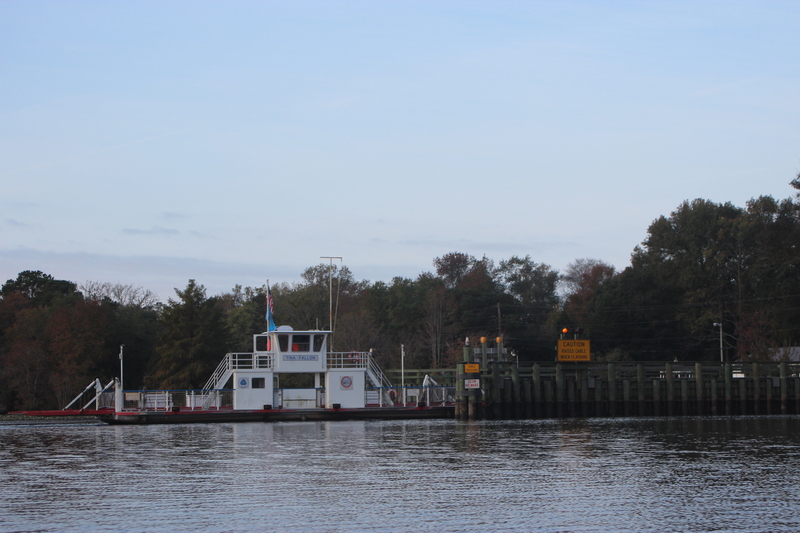 It wasn’t long before we came upon the Woodland ferry, one of the oldest (if not the oldest) cable drawn ferry’s in the US. 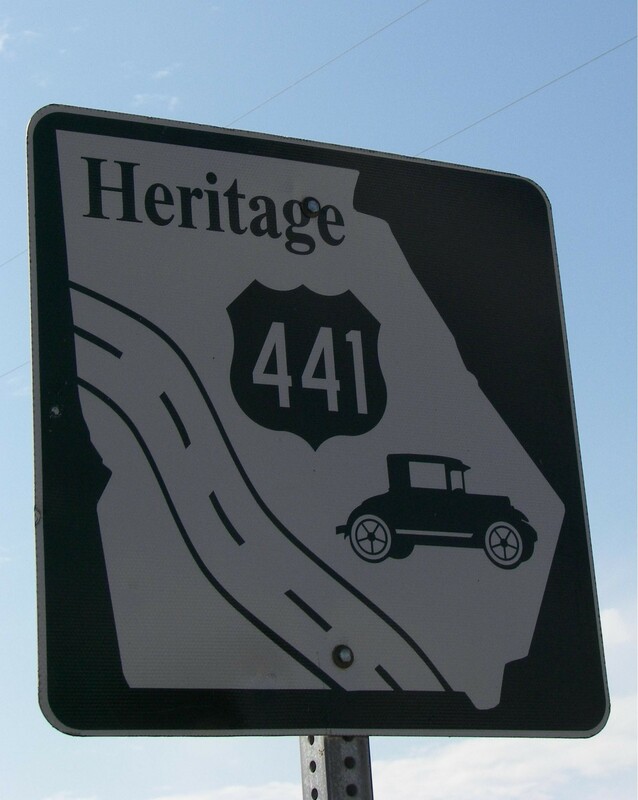 It has been in continuous operation since the 1740’s; lots of history. As we neared it made its crossing; easily exposing the cable in front of us that guided its course. 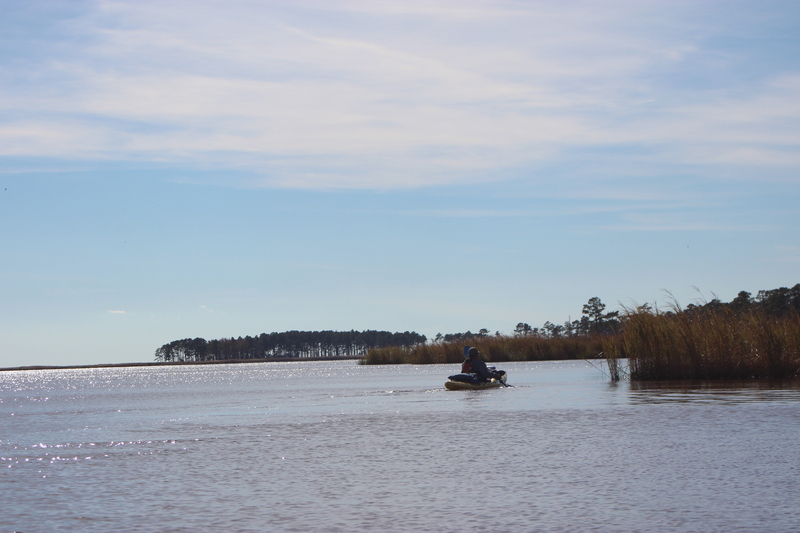 The miles before Sharptown seemed relatively mundane; at low tide its easy to see where the turtles have slid into or out of the river – the reeds are common – pretty similar to other coastal areas that I have paddled; but what was it that I was looking for anyway? We had observed more than 10 bald eagles as the miles on the Nanticoke continued to pass quickly, wildlife habitat is noticeably abundant along the Nanticoke. 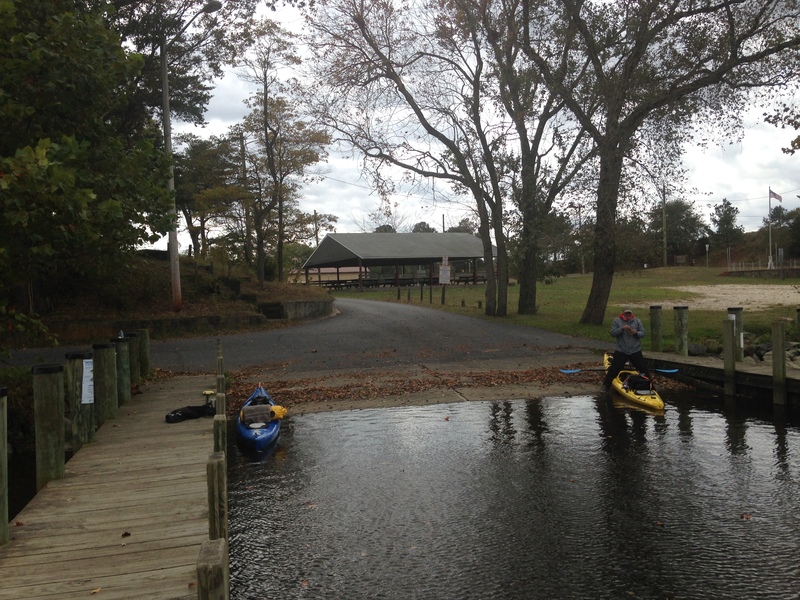 From Delaware is Sharptown; a little town just in Maryland with a nice pavilion and boat ramp. It was a great place to stop, stretch, and have a sandwich. The next rivertown after Sharptown was Vienna, Md in pre-planning the paddle it seemed a good goal for the first day; maybe find a pavilion, gazebo, or some level ground to stop and pitch the tents. We also knew that in our three-day window of paddling the Nanticoke; that this would be the worst day ‘weather-wise’ that we would face. As we paddled from Sharpton the morning turned into early afternoon and the weather came distinctly from the SW; the direction we were headed. There are points in paddling that you pull all the associated factors together and make some decisions; different rivers/lakes present alternating factors that affect any paddling strategy that you may have. The factors of the Nanticoke on this date was the one of paddling the longer routes of the shoreline which provided some natural protection from the adverse winds. Still, there are always points where crossing the meandering ranges of a river is necessary. The illusion of wind and tide coming against you is that you not progressing, when the truth is – you are simply achieving less – sometimes it takes a glance into the shoreline to see any advance. The afternoon had pitted us against the wind and waves; there was even a ‘brutal’ point to it all – ‘one stroke at a time,’ jail-break stuff. Thoughts then, passed happy thoughts of not being in a canoe – but from Sharptown that’s where we were with the elements. Pounded; It just meant that we weren’t going to get as far as we had hoped for the day, but hey, this was about enjoying the outing, right? With the hwy 50 bridge and Vienna (the goal) in sight (actually 3 miles away), we found a stand of trees near the marker 34 (I think) – Gordy stated that he had enough! It was a good call. The crossing we had just made toward this stand of trees had taken more than an hour – the last couple of hours were at the point one couldn’t even stop to take a drink – or you would risk losing ground. The day of pleasurable paddling had become WORK! and I easily agreed with the stop! – after all, this was about being on the river, not doing the river. Good things don’t come easy. Solid paddlers go down with the sun and rise with the morning light, it was no different on the Nanticoke. I got up a couple of times to stoke the fire as the rain and weather passed. There was a single owl in the night, along with combinations of screeches from the eagles. Within it all I slept great, even though there were also periods of the associated sounds of a highway in the distance. With daylight came hot-water and some of that ‘river-jolt’ coffee. Food was an old MRE of eggs and bacon that I was using up from a previous paddle. The river was calm. Picking up as you rise is another rhythm of spending time in motion along a river. It came easy along with early conversation about the things you should or should not talk about before you go to sleep alone in the woods. 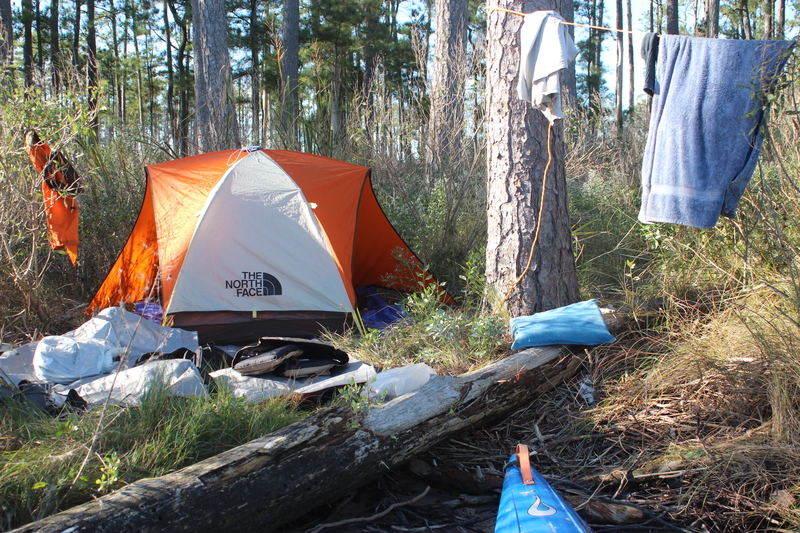 A few early laughs and our kayaks were packed and ready to slide into the water like a big ole Florida gator. Once again on the water by 8am. Yep another low tide point; – tide coming in. The plus was that it was early and that the weather of the day was improved – this time winds from the NW were into our backs. Vienna came on the early flat waters of the Nanticoke, the land of an indian village when John Smith came through in the 1600’s. The highway 50 bridge marks a sharp bend in the river for the tows to navigate. Yes, there are towboats and barges on the Nanticoke – like the Mississippi. The difference here is that a tow pushes a single barge; on the Mississippi they push up to 42!, yes six wide and seven deep! been there. Fishermen were trying their luck as we passed under the bridge. Vienna had a great little marine/dock area; along with a small park and pavilion along the shore. And there was some riverstuff along the way too, I really like riverstuff – and would have a yard full of it if I could; maybe it runs in the family. More eagles on the second day; the one above had dropped out of the sky and into the marsh on a female; who then flew out. He took a good long drink before flying off to rejoin her, making me wonder if eagles ‘paired’ for life. The marsh/wildland habitat along the river so far has been commendable; the area is alive with foul. We noticed numerous ‘duck-blinds’ too, indicating that its an active eastern fly-way for geese and ducks. It was easy to become absorbed with the surroundings before noon, but as things warm the wind reminded us that it too was present. Even though the wind was at our backs, that too created challenges. There were times that we had to put the wind at our back and shoot the long ‘line’ to the distant marker. 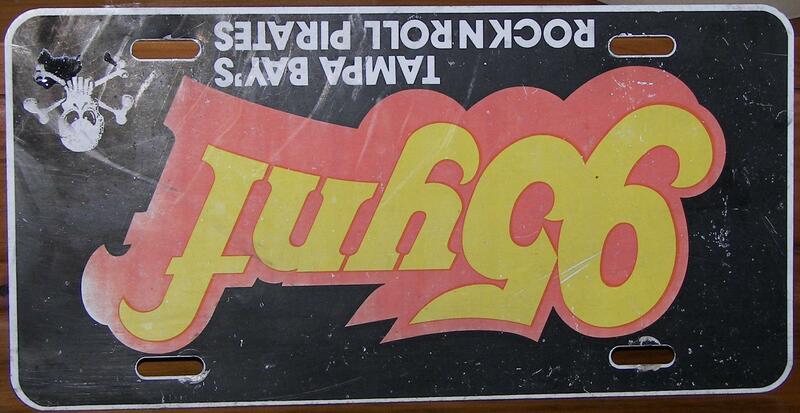 ‘Rouge‘ 2-foot waves (as Gordy called them) would come over the rear of his vessel – and into it. 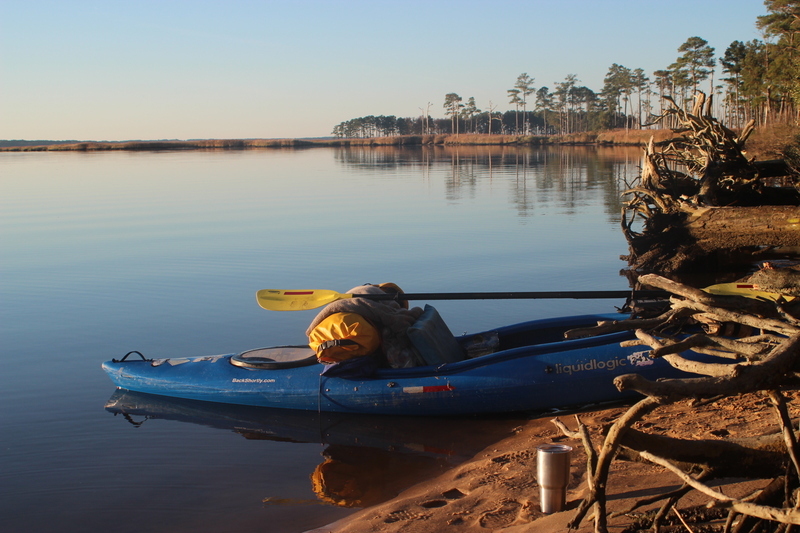 I was paddling in my oldest kayak, ‘traveller.’ Always an appaloosa of a pack-horse in which I have covered many miles across numerous states – but was beginning to doubt its ‘coastal’ worthiness. The wind vs tide was causing me to do alot of ‘digging’ with my left paddle to hold my course. With all of that my right arm began to cramp – I can’t think of this ever happening before. With more wind/tide ahead, it wasn’t a good time to cramp up. Truth is that I hadn’t hydrated properly on day one. During a cramp-break we reminded ourselves that we were out here to escape; not to beat ourselves up. Gordy had some Gatorade powder of which I put into my water supply, and after a 30 minute stop – it seemed to make the difference. We eased down the smooth side of the river, stopping a bit later to step out and take a look around. This is where we met a local farmer Bill Larimore, awesome man on a tractor working on a place for our wounded warriors to come hunt deer and maybe find some peace too. It was great talking to Bill, nice guy. Bill also told us of a nearby shortcut that we could use through the upcoming marsh – it was out of the wind and helped alot in reaching the big water ahead. Before the big-water and somewhere near the Fishing Bay Wildlife Management area we found a stand of trees breaking the wind and called it another early day. With darkness upon us at 6pm each night in the fall, it was kinda nice to stop at three and enjoy setting up camp at three, no rush. Facing east and sheltered from the relentless wind of day 2, our view over the marsh grass of the Nanticoke was spectacular; we even had a small fire at the shore. – and the evening became night. It was one of those nights along the river that reminded me alot of the Mississippi river adventure from a few years back. There have been times where I have loved where I was so much – that I hated to go to bed each night. I savor those times. As I did this night also; I did not want to climb into that tent. Through the darkness of the night, the owls that I have come to love hearing along rivers returned. Two or three chimed their tunes in the tall pines around us. There were more of the sounds of eagles, and I was introduced to the Sika Deer’s presence; a small Asian deer that was introduced into the area in the 20’s. These deer make noises like I’ve never heard in the woods before. I woke several times in an abyss of silence – I liked that too. It was so quiet……. that I could hear dawn slipping in. With the early light I stood on the little bit of shore we had as the sun broke over the horizon; now this is what paddling is about… being there, these moments. Life is good. No hurry as the gear came together and the ‘river-jolt’ coffee came to brew. The place was beautifully lit by the morning sun. It was low tide once again. 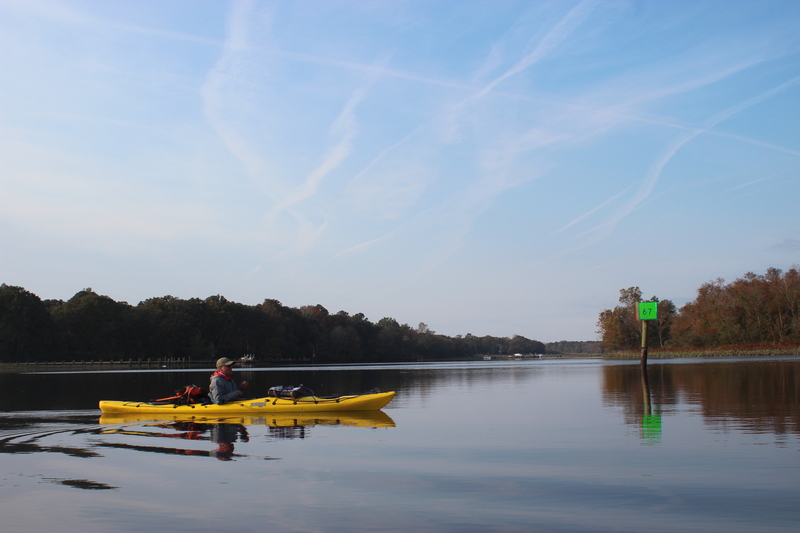 I think we made the first ripples in the Nanticoke on day 3 ; the water was flat as we set another long course toward the long point marker and Sandy Hill camp across the way. 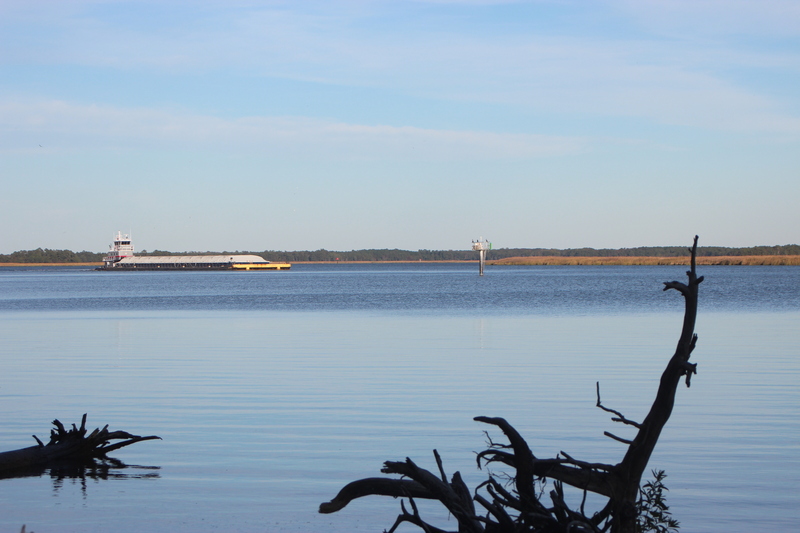 The river continues to open up, once around long point we entered the Nanticoke River Sanctuary. 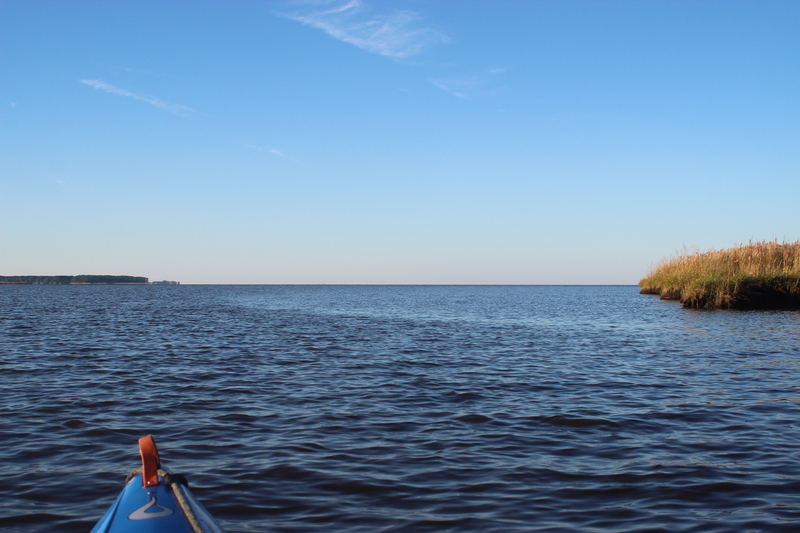 A large expanse of water, we were glad that there wasn’t a short-cut through the marsh from camp because it would have left us with a greater paddle across this bay. 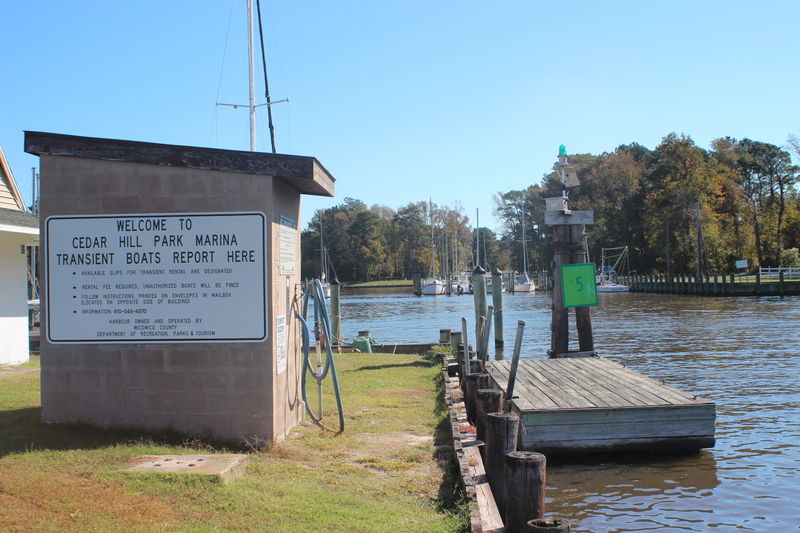 We set a course to the only visible marker at long-point; then continued to adjust towards a longer course for Dashells point (at Tyaskin, Md) as the waves and any other factors allowed. The mornings calmness was good to us and it was a long course across the bay (Gordy against the sunshine above). Nearing shore at Wetipquin creek, we continued along the shore of the Chesapeake. 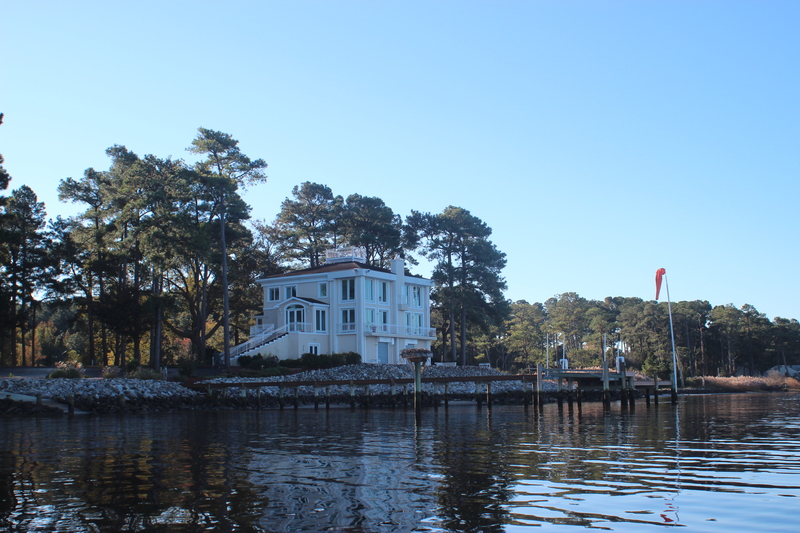 There are some really nice homes with awesome views along that stretch of water; these were a change from upriver – still something nice to look and think about in passing. 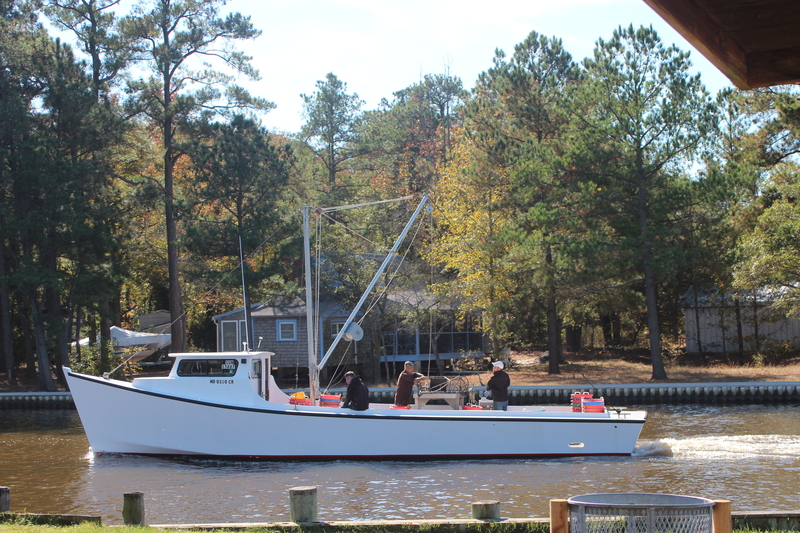 In the distance we could hear the steady rumble of a crabbing boat at work – as we got closer the ‘Addi-tude’ was out working in the bay; open exhaust, long gentle circles, outriggers rotating one dredge at a time in for culling. Loved it. It was a beautiful day, you could see all the way to the horizon and hear as far. 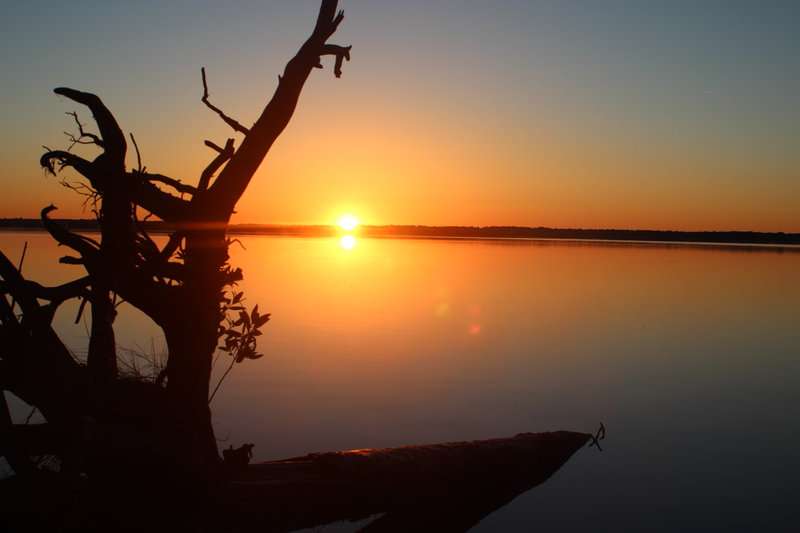 This was our reward for paddling the Nanticoke…. 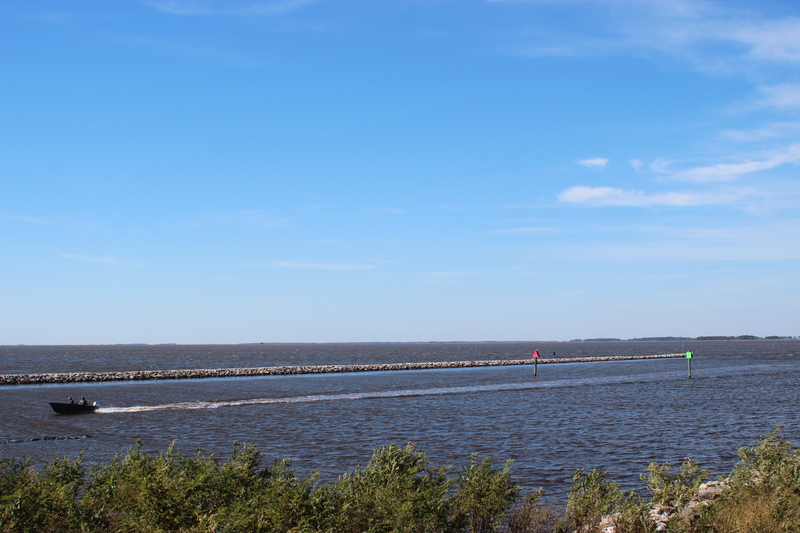 Once past the jetty’s of Byvalve we continued down the shoreline in wanting to meet our goal of Nanticoke. At ragged point just before Nanticoke we encountered some pretty good rollers and the wind had picked up since Byvalve – lets reevaluate. Stopping to stretch at ragged point we noticed the same type of ‘favorable’ waves that had worked us hard through the previous day – was another mile worth it? Another one of those decisions; some more of theose ‘factors.’ We had indeed accomplished and met our initial goals (escape, paddled as far as Nanticoke) – with that said, we headed back to the Cedar Hill Marina at Byvalve hoping for some ‘land-food.’ On return the waves had increased further and it was quite the ride getting to the end of the jetty and entering the marina – once inside the jetty’s there was plenty of flat-water waiting for us. Evidently this is a part of a paddle trail also – always good to see those signs. 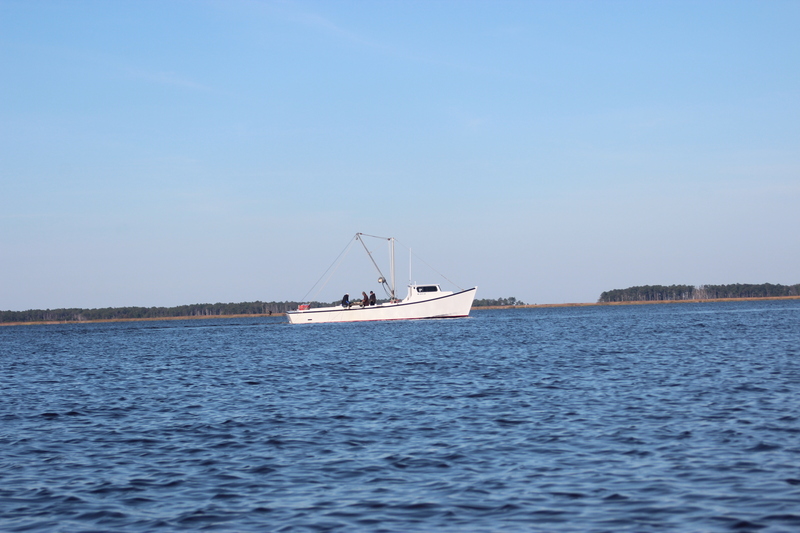 And the crabbers came in to fill some local buckets. 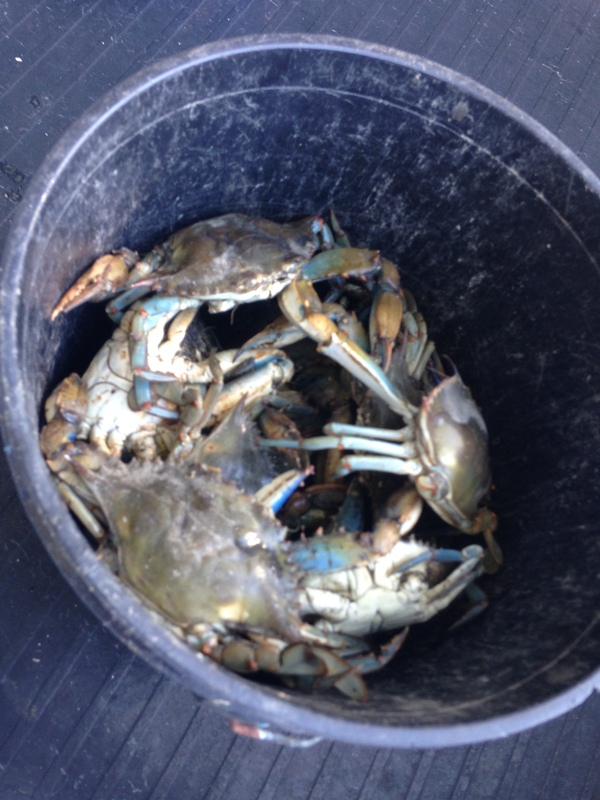 One fellow said that they wanted to ‘get them before they got down in the mud.’ This time of year (October) the crabs fatten up and go deep for winter…. Paddlin the Nanticoke was great. 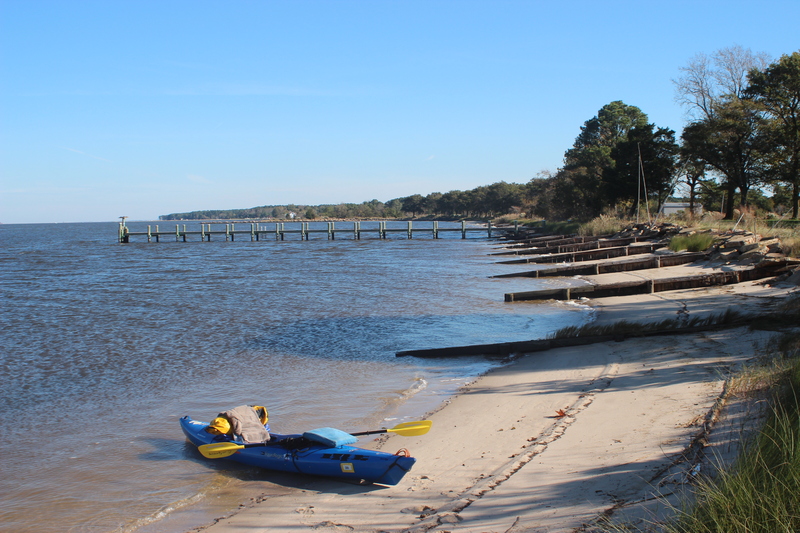 As I sat just down the road at Booniee’s Beer & Bait scarfing down some fine wings and a cold brew while staring at Katlyn (the bartender dressed like an indian) – I thought about the river and the experience of paddling down from Seaford to the bay. 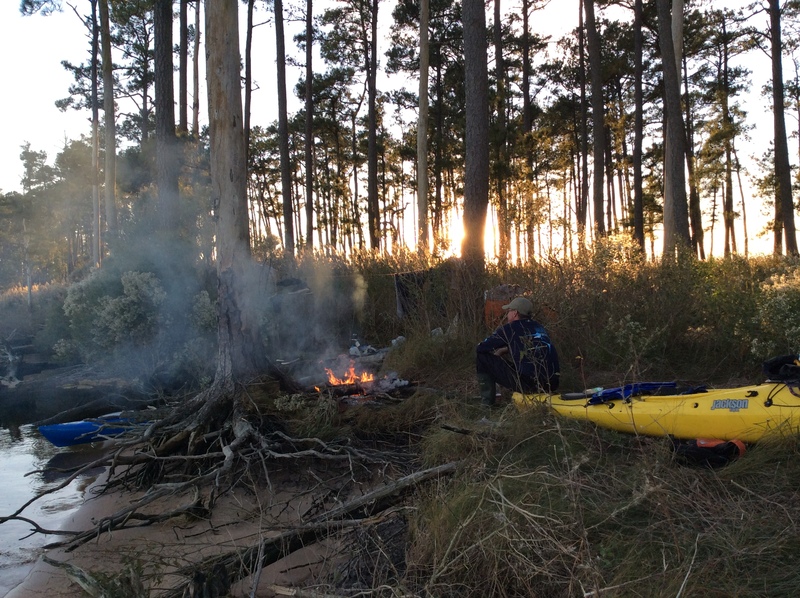 I’d love to tell you more about how beautiful it was and how neat the wildlife and all the other riverstuff along the way was – but I’m stuck on how good it feels to escape through paddling a kayak. 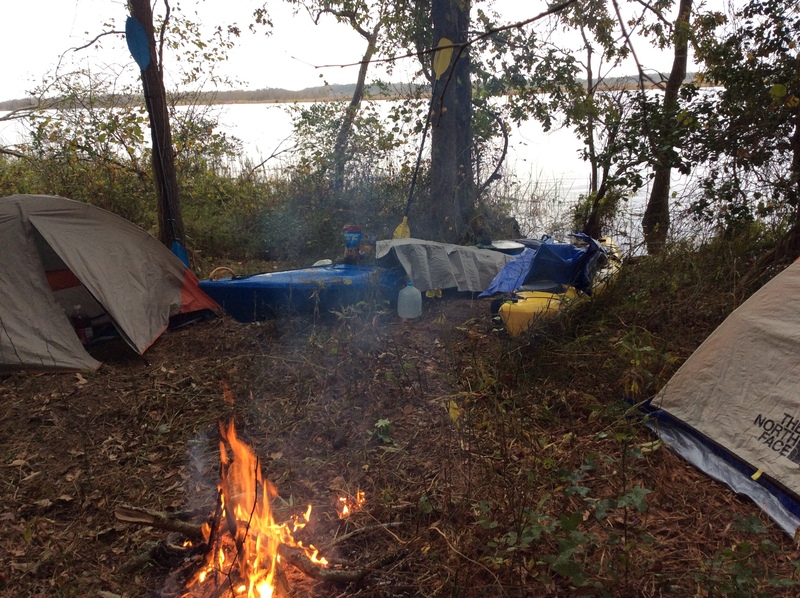 A good couple days/nights in the wild on the river is good for ones soul, thanks Nanticoke – I needed that. 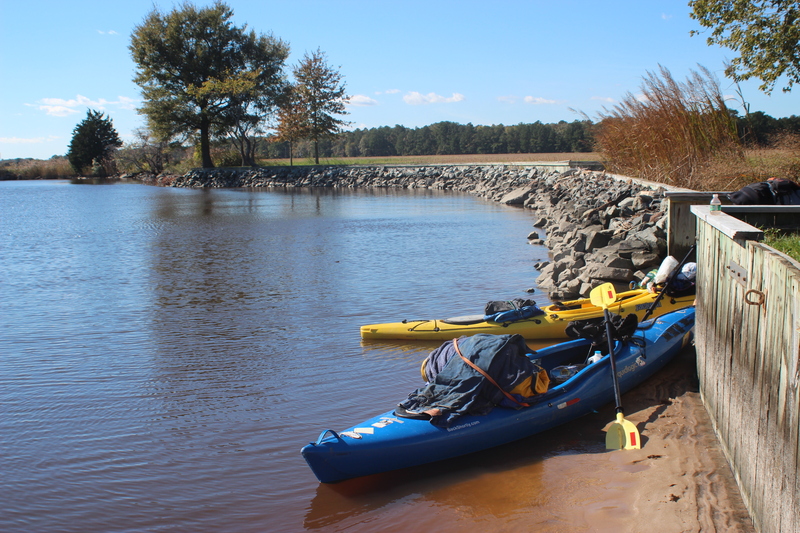 Other good information about Paddling the Nanticoke information.